In the United States, flu season typically stretches from November to April, peaking in January or February. Each year, somewhere between 5% and 20% of the population will come down with influenza, and around 200,000 people will be hospitalized because of the virus. Needless to say, those are huge numbers, and the medical community has responded in kind—the influenza vaccination annually reaches over 100 million people in the U.S. (for the 2014-2015 flu season, 150 million doses were manufactured). But what is the economic cost of the flu virus? 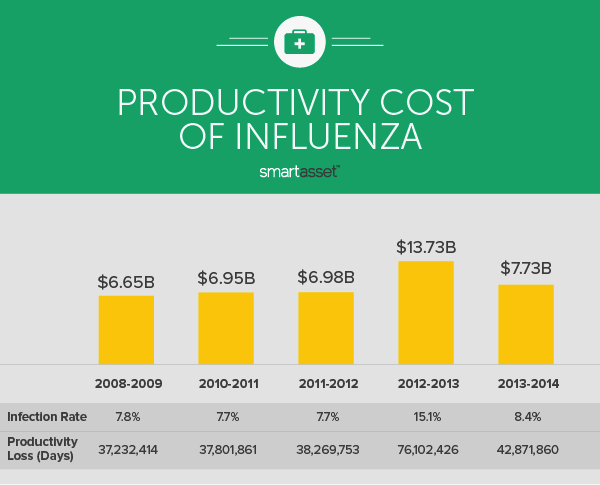 Using data from the CDC and the Google Flu Trends database, SmartAsset looked at the impact influenza has had on productivity in recent years. $42 Billion. That’s how much the flu has cost in lost productivity over the past five years (excluding the H1N1 flu season of 2009-2010), an average of about $8.4 billion per year—more than the entire annual GDP of Napa Valley, California. How severe was the 2012-2013 flu season? According to our analysis, 15.1% of the U.S. population was infected by influenza in 2012-2013, easily the highest over the five year period we examined. The total productivity cost of that year’s flu virus? $13.7 billion. Don’t mess with Texas. The Longhorn State and several of its neighbors have been hardest hit by the flu in recent years. Texas, Louisiana, Oklahoma and Arkansas have accounted for almost one fifth of total flu-related productivity costs in recent years, despite having just 11% of the country’s population. Below are the annual average results for each state. Note that our estimate does not include medical costs, which means that the total cost of influenza is likely much larger than the productivity costs listed below. Want to move to Utah? Find out how much house you can afford there. The Mountain States appear to be relatively insulated from the flu and its associated costs, at least over the past several years. Colorado, Wyoming, Montana and Utah all had average annual infection rates under 5%, and annual flu-related productivity costs between those four states were just $114 million. By comparison, in Louisiana alone productivity costs were $188 million. New England has also avoided the worst impacts of the flu. New Hampshire, Rhode Island, Vermont and Maine all had average infection rates between 4.7% and 4.9% from 2008 to 2014. On average, those four states lost just 357,000 days of productivity from influenza over the time period we looked at, less than half the annual average of Arkansas. California and the Southwest were among the hardest hit regions. Between the three states (California, New Mexico and Arizona), total productivity costs were nearly $1.5 billion per year over the time period we examined. 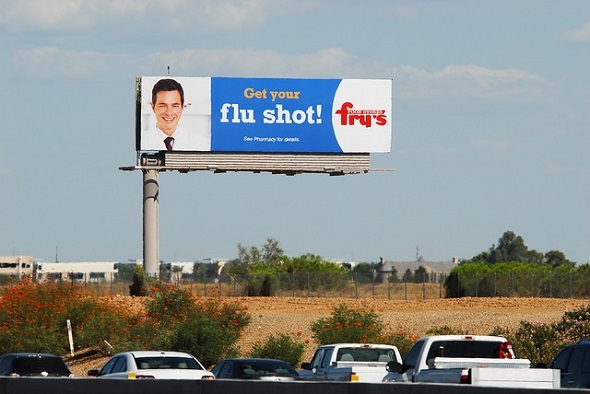 California alone has lost a total of almost 30 million days of productivity because of flu infections over the past five years. While we are still in the middle of flu season, this year is shaping up to be among the worst in recent memory. Flu activity is currently high in most states, and has been since mid-December. That means millions of people across the country are being forced to stay home sick, and, if past trends hold, productivity costs this year could top $10 billion. 1. Google’s flu trends reflect average weekly influenza like illness (ILI) cases per 100,000 physician rates. To convert those to actual infection rates, we combined them with CDC data on the long-run average infection rate, the same methodology used in Molinari, et al (see note 3). 2. We looked at 2008 – 2013, excluding the 2009-2010 flu season. That year, the threat of the H1N1 flu pandemic led to unusual Google search activity and disrupted the flu trends data. 3. See Molinari, et al: The annual impact of seasonal influenza in the US: measuring disease burden and costs. Published in Vaccine 2007. Available online at sciencedirect.com. 4. We did not incorporate the productivity loss due to influenza-related deaths in our calculation, but this is a significant cost. Several thousand people die each year following severe flu infections.